Executive Women International® ("EWI®") is an international, nonprofit organization of leading business, service, and professional firms. While membership is by invitation only, we strongly encourage you to apply! The firm holds the membership, while an individual engaged in an executive, key administrative, or executive top-ranking position, and whom the firm’s executive appoints, serves as its representative. You can also join EWI as an Individual. For more information please contact our Retention and Recruitment Director. Executive Women International® was established in California in 1938 when Lucille Johnson Perkins recognized the importance and potential of an association of key women working with their executives to promote their firms and improve their community. On April 29th of that year, Articles of Incorporation were filed with the State of California under the name of Executives' Secretaries, Inc. In May 1939, the Los Angeles business community recognized the value of such an organization, and that city's chapter was chartered, and EWI was on its way. Since then, additional cities throughout the United States and Canada have joined, forming a prestigious and exclusive networking organization of key firms and individuals. During the 30th Annual Meeting of the corporation (May 1977), the organization's name was changed to "Executive Women International." This change reflects the international expansion of the organization and recognizes the changing roles of women in business and the diverse careers held by its representatives. Over 1,400 companies and 1,600 representatives are members of EWI today in 45 chapters located in major cities in the United States and Canada. 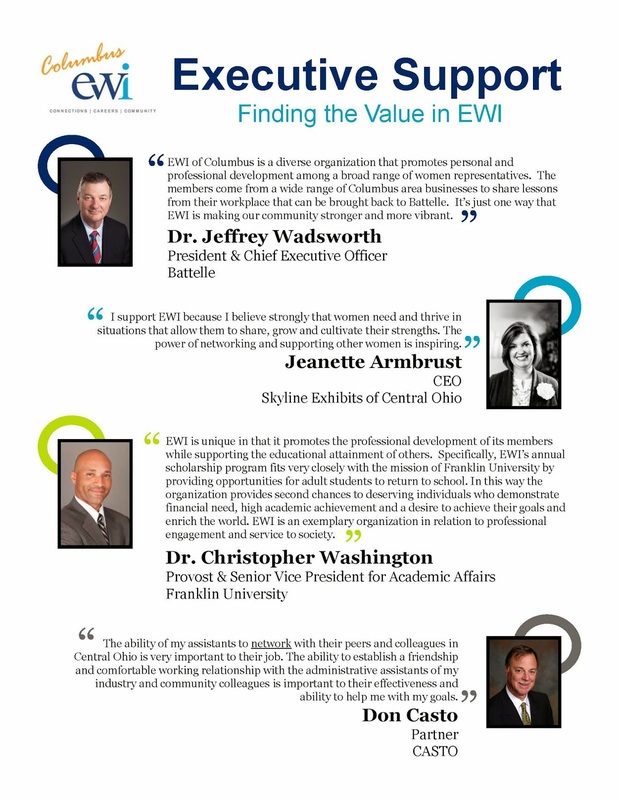 EWI is the premier organization for networking and leadership development for today's business professionals and their firms. Copyright EWI of Columbus 2012. Simple theme. Powered by Blogger.